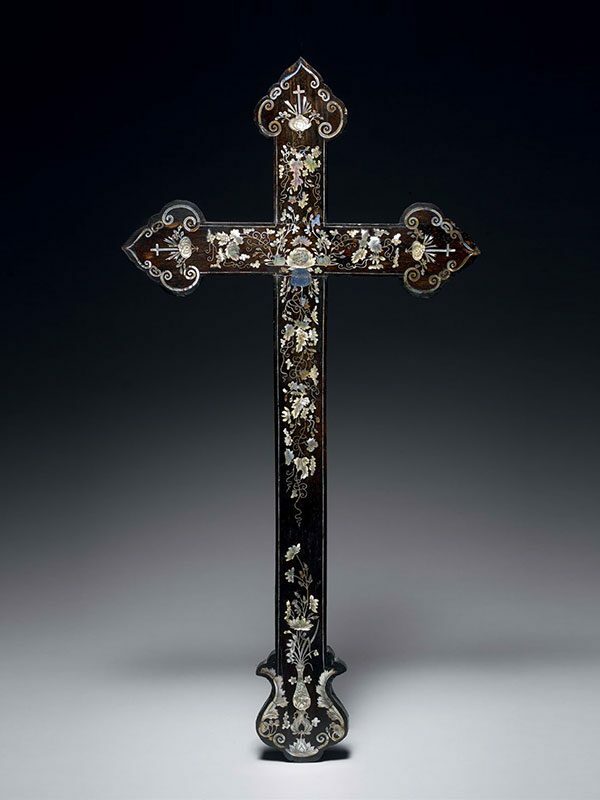 A very large mother-of-pearl inlaid wood ‘apostle’ cross. The cross-section inlaid with incised pieces of mother-of-pearl depicting fruiting vines, flowers and foliage, ending with a stylised flower within a ruyi-shaped scroll. Both ends and top have a cross in the centre. The lower end is inlaid with a vase with flowers, surrounded by scrolling leaves. The reverse is plain. After the arrival of the Portuguese in the sixteenth century Macau became a diocese of the Catholic Church. The Diocese of Macau was given a wide jurisdiction over various ecclesiastical territories in the Far East, such as China, Japan, Vietnam and Malaysia. Macau became a major training and departure point for Catholic missionaries to different countries in Asia and crosses such as this example would have served in the teaching of the Bible. The acanthus leaves at the bottom of the present cross are similar to those that appear on 18th century Chinese enamelled wares. The long elaborate tendrils on the flowers are similar to those seen on grape-and-bottle gourd motifs on Chinese decorative arts. The three upper terminals of the cross are formed in the shape of ruyi-heads, symbolic in China for ‘everything as you wish’. They also correspond to a design known as the cross botonée, used in Western heraldry as well as religious art, where the three lobes are said to represent the Trinity.